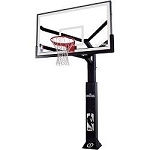 Product: Spalding In Ground Basketball Hoop Arena View Series 88724AGP 72 Inch Glass Backboard - 8 Inch Square Post. 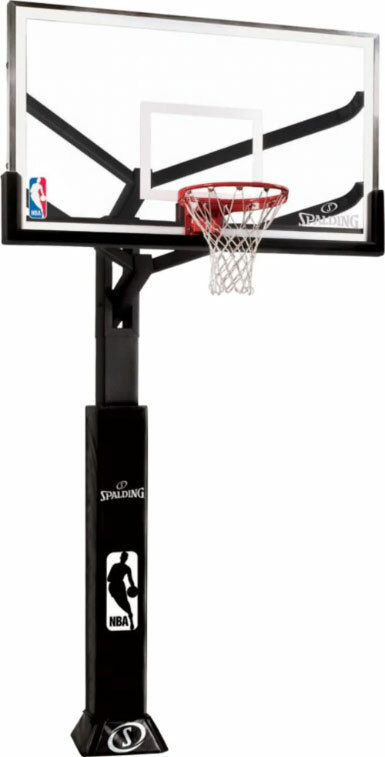 Spalding brings you the best In Ground basketball system yet. This Arena View system comes with a regulation size 72 inch glass backboard. Besides having the great rebound of a glass backboard, this tempered glass measures a full 1/2 inch thick. The unit is especially stable, beyond what a Mammoth Basketball Hoop or Goalsetter could offer, with a full one piece 8" square post. The rim on this system represents an industry first in that the rim flexes in 180 degrees instead of just from the front on traditional break away rims. This provides great longevity in the rim and better dunking overall. 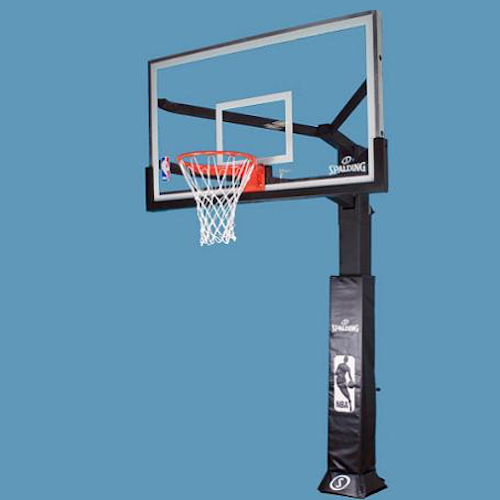 This unit is great for sports courts, or just for a backyard system for the family. 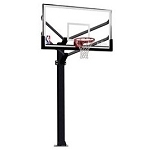 The height adjustments allow the rim to change from 7 ft. all the way to regulation height 10 ft. All metal parts of a protective finish on it the helps resist rusting. 72" x 42" x 1/2" Tempered Glass Backboard. 1 1/2" steel framing around the backboard. Integrated 4" x 2" x 72" lower board from reinforcement for improved stability. Competition Style 4" x 5" rim. Basketball Rim flexes 180 degrees, whereas traditional breakaway rims only flex forward. Heavy Duty wrap around support arm with continuous ram. The rim is regulation 4' offset from the pole. U-Turn Pro lift mechanism allows you to turn a crank, which moves the rim from 7' to 10'. Crank Handle can be removed from U-Turn mechanism to prevent tampering. Has 8" one piece pole providing one of the industry's largest, most stable pole sets. Comes with Stadium style pole pad and gusset pad. Powder coated black matte finish to help resist rusting. Hinging base plate enables ground level assembly of backboard and goal. Limited lifetime warranty on the backboard. All other hardware features a 1 year warranty. 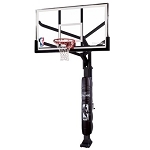 Competitive Edge Products is an authorized distributor for Spalding Arena View Basketball Systems. If you find the 88724AGP for cheaper anywhere else online, please let us know. We will try to match or beat their advertised price (price of the product + any shipping costs). Fast Shipping: Orders for the Spalding 88724AGP generally leave the warehouse within 2-4 business days. Delivery Details: This product ships directly from the warehouse in Alexander City, AL. This item generally ships via a curbside delivery through an LTL carrier (too big for UPS and FedEx). The customer must be present to sign for the order. The freight carrier is instructed to contact you prior to delivery to set up a delivery appointment. Dimensions: 119" x 72" x 42"